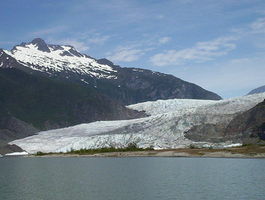 1 Glaciers are huge masses of ice that flow slowly over the land. Glaciers are found in cold polar regions and in high mountain valleys. About ten percent of Earth's land is covered by glaciers. Did you know that glaciers can be found on every continent except Australia? Yes, even Africa has glaciers! 2 There are two main kinds of glaciers. Valley glaciers are found in mountains. Continental glaciers, which are also called ice caps or ice sheets, cover millions of acres in Antarctica and Greenland. They may be more than three miles thick! Glaciers hold about one-and-one-half percent of the Earth's fresh water. 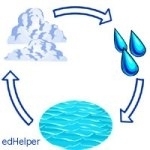 For this reason, they are an important part of the water cycle. 3 Glaciers happen because more snow falls than melts. Year after year, more and more snow piles up. Pressure from the weight of all that snow makes the lower layers change into ice. You may have noticed when you "pack" a snowball that squeezing the snow causes it to turn into a hard, icy lump. The same thing happens to the bottom of the glacier. Then gravity causes the icy mass to move down the slope. Friction and pressure cause the bottom layer to melt. This helps the glacier slide. As glaciers move, deep cracks may form in the top surface. The ice on top is brittle and uneven. One of these cracks is called a crevasse (kruh VASS).